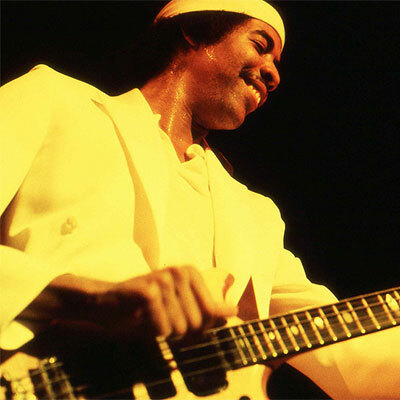 A brilliant player on both acoustic and electric basses, Stanley Clarke has spent much of his career outside of jazz, although he has the ability to play jazz with the very best. Clarke was born in 1951 in Philadelphia. Encouraged by his musically-inclined mother, he took up violin and cello at an early age, only to find his hands growing too big to comfortably play the violin and his legs much too long to easily accommodate the cello. Turning to the bass, he played in R&B and rock bands beginning in junior high school. After high school he enrolled in the prestigious Philadelphia Musical Academy. After moving to New York, Clarke worked with Pharoah Sanders in the early '70s. Other early gigs were with Gil Evans, Mel Lewis, Horace Silver, Stan Getz, Dexter Gordon, and Art Blakey; everyone was impressed by his talents. However, Clarke really hit the big time when he started teaming up with Chick Corea in Return to Forever. When the group became a rock-oriented fusion quartet, Clarke mostly emphasized electric bass and became an influential force, preceding Jaco Pastorius. But, starting with his School Days album (1976), and continuing through his funk group with George Duke (the Clarke/Duke Project), up to his projects writing movie scores, Stanley Clarke largely moved beyond the jazz world into commercial music; his 1988 Portrait album If This Bass Could Only Talk, and his 1995 collaboration with Jean Luc Ponty and Al DiMeola on the acoustic The Rite of Strings, are two of his few jazz recordings since the '70s. Clarke's commercial composing begin with his Emmy nominated score for "Pee Wee's Playhouse," he progressed onto the silver screen as composer, orchestrator, conductor and performer of scores for such blockbuster films as: Boys N the Hood, What's Love Got to Do With It (the Tina Turner Story), Passenger 57, Poetic Justice, Little Big League, and Romeo Must Die. He scored a Michael Jackson video release directed by Jon Singleton entitled Remember the Time, and the Showtime Network's "Soul Food."